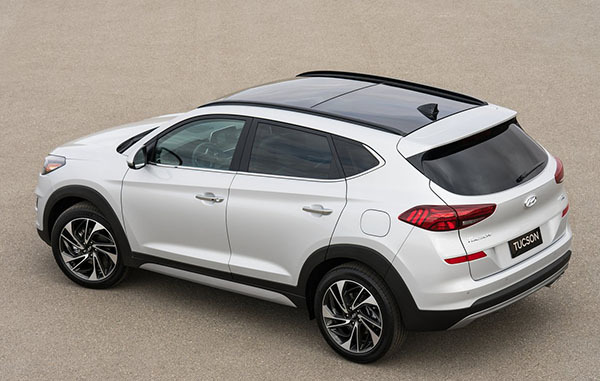 Hyundai did not ruin the Tucson design with the mid-cycle refresh. But it really does not look better either. The new front end looks less aggressive and even a little bit older. They did a good job inside. making the interior look newer than it is. By mostly just changing the top part of the dash. And also using that stupid tablet design that seems to be all the rage these days. 2 engines are offered. A 2.0 Liter with 164HP or a larger 2.4 Liter with 181HP. While the automatic still has just 6 speed. The revised front end has a flatter, less three dimensional appearance to it. I’m not entirely sure that it looks better. 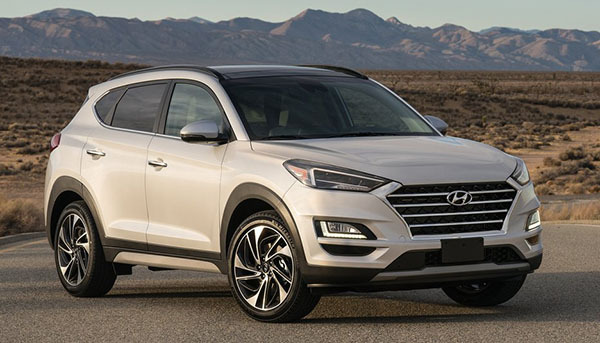 I guess I was expecting a more extensive revision that would have made the Tucson fit in better with its two newer siblings (Kona and new gen Santa Fe). The new front end looks similar to the facelifted front end of the previous gen i30/Elantra GT. 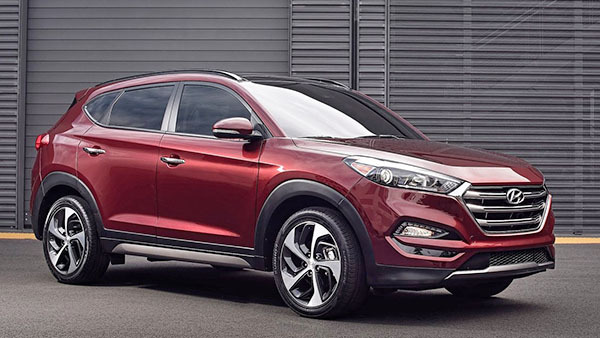 I see that we will finally get the chrome side window trim that has been available on the Tucson in other markets since the launch of this generation. I guess the gear count on the auto trans won’t increase until the vehicle is completely redesigned. It does eliminate the dual clutch trans that accompanied the turbo engine, which may be a good thing considering some of the complaints I had read in reviews regarding the quirks with this transmission. I wonder what replacing the small displacement turbo engine with a larger displacement naturally aspirated engine will due to the vehicle’s fuel economy figures. I agree that the interior update is an improvement. Overall, the Tucson is a nice looking compact CUV that may be slightly falling behind the times just a bit. I’m not sure the revisions go quite far enough to keep it competitive in its segment. You think they could show the revised model in a more interesting/appealing color than white. It almost seems like Hyundai wants it to be anonymous and invisible. Wait, I missed that, the 7 speed DCT is GONE for the 2.0T? That's a MIRACLE! If I am not mistaken the 2016-18 Tuscon was never offered with the 2.0T. The 1.6T 7spd DCT was the top rated powertrain. i think it looks great. 184 HP should be plenty for the top engine choice. Really like the interior redo. Looks way nicer with the lighter leather in grey (white? ) and black two tone. 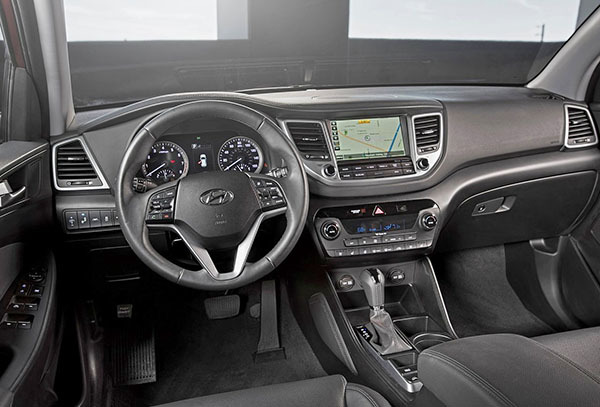 I went and checked out the tuscon when it first came out a few years ago (of the current body style) and the pitch black interior with dark grey dash/door panels made me nauseous ....was just a dark cave....suffocating to me. Anywho, this will compete nicely against the honda hrv/nissan rogue sport and the subaru crosstrek...all which are very similar in size but have fairly weak engine outputs of 146-152 Horses. The 2019 Tucson will offer one of two different naturally aspirated engines (depending on trim level); a 2.0L or 2.4L, both are paired with a conventional 6 speed automatic transmission. The turbocharged 1.6L engine and 7 speed dual clutch transmission offered on upper trims of the pre-facelift version of the Tucson will no longer be available on the revised 2019 model. I believe the turbocharged 1.6L engine and 7 speed dual clutch transmission is available on upper trims of the Kona. The Tucson’s platform mate, the Kia Sportage, is available with a turbocharged 2.0L engine and a 6 speed auto trans. A close friend just left Hyundai upper management in Canada. This company has lost ground. Ground it never deserved. No substance no future. They are charging real car prices now to boot.